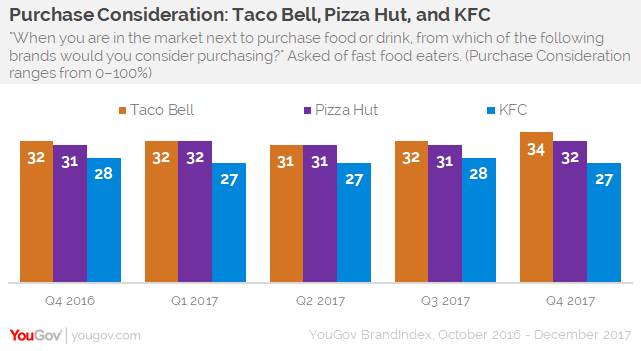 Heading into Yum Brands’ fourth quarter earnings this Thursday morning, only Taco Bell has shown an increase in purchase consideration among fast food eaters compared to the same quarter in 2016, according to YouGov BrandIndex. Purchase Consideration is YouGov BrandIndex’s key metric of potential sales revenue. Because of the highly competitive nature of the dining industry, every percentage point increase or decrease is potentially worth millions of dollars. In its first three quarters of 2017, between 31% and 32% of fast food eaters said they’d consider buying their next fast food meal at Taco Bell. In the fourth quarter, that percentage increased to 34%. Taco Bell is known for conjuring up new menu items, such as last year’s Naked Breakfast Taco, Loaded Taco Burritos, Mexican Chicken Crispy Pizza, and Dollar Stackers quesadillas. Last year saw the increased roll-out of its spin-off Taco Bell Cantina, which features alcohol, different menu items, and a DJ. Yum’s other two brands remained very much in place. Pizza Hut stayed relatively flat with a purchase consideration moving between 31% and 32% among fast food eaters throughout the last five quarters. KFC wavered between 27% and 28% each quarter. Despite a mixed reception from fast food eaters, Yum Brands maintains an overall purchase score average much higher than the fast food industry average. 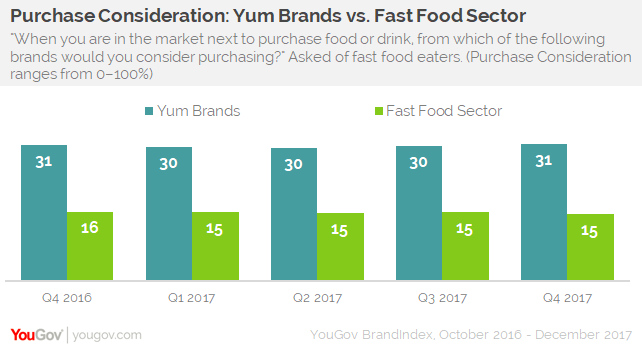 Yum’s 31% purchase consideration with fast food eaters is currently 16 percentage points higher than the fast food industry average, yet still at the same level it was during the fourth quarter one year ago. In YouGov BrandIndex research, a fast food eater is defined as an adult aged 18 or over who has eaten fast food at least once in the past three months.